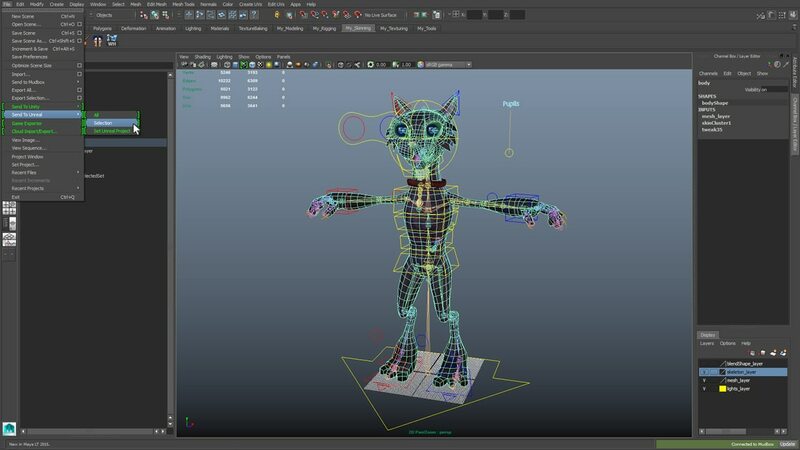 Maya LT is designed to make it easier for indie game makers to get their 3D models and animations into game engines. Special export options like Send to Unity and Send to Unreal make it easier for indie game makers to get their assets into their Unity or Unreal projects. Send to Unity lets artists export content from Maya LT directly to a Unity 3D Engine project folder. Assets exported in this manner appear directly within the Unity project. Send to Unreal lets Maya LT users export content directly into their Unreal Engine 4 project folder. Both export options allow export for model or scene selections with no polygonal restrictions in the FBX format.